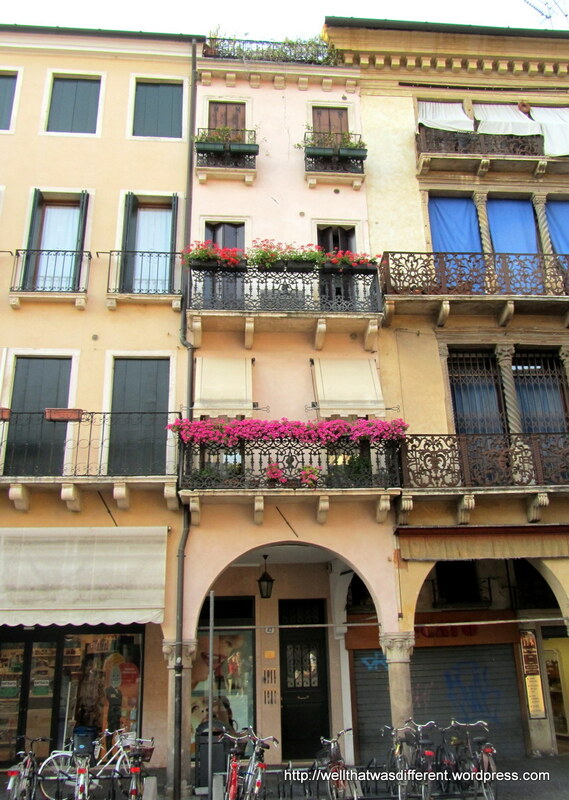 So, last weekend we made a little dash down to the Veneto. 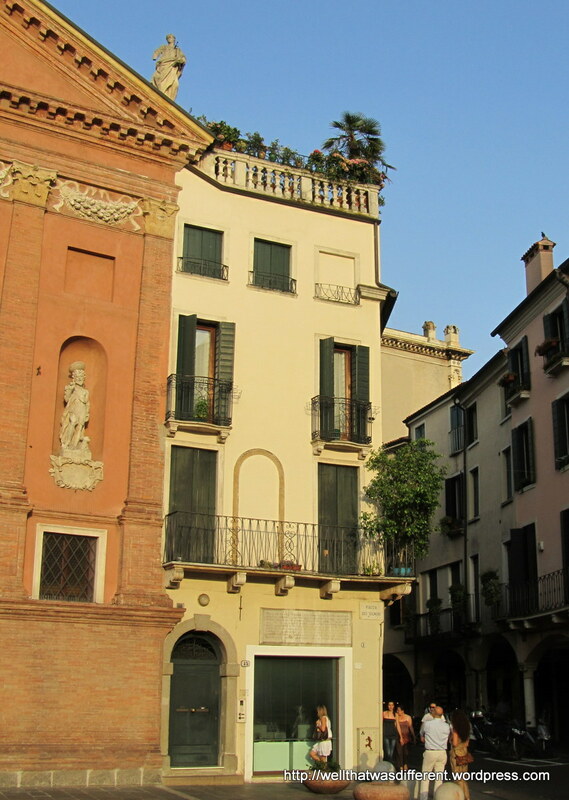 Because proximity to Italy is the real reason we bid on this post. Shhh, don’t tell! 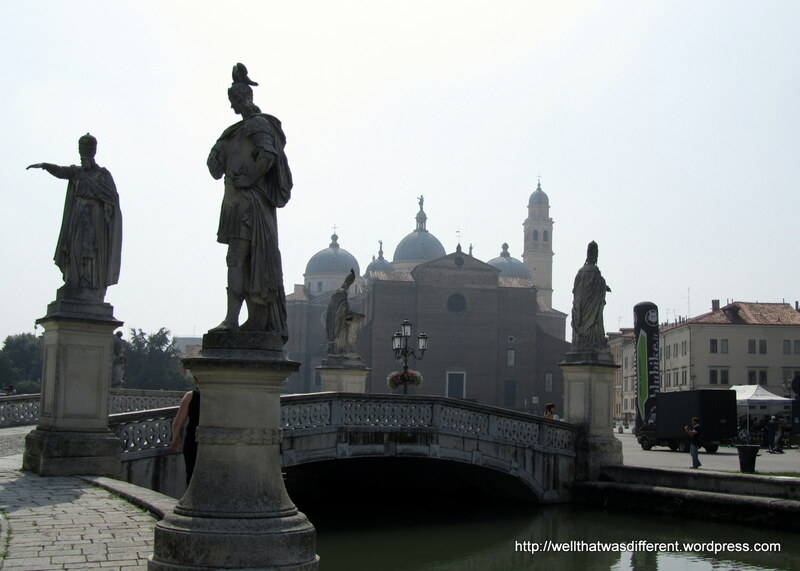 We stayed four nights in Padua, about half an hour from Venice. The main reason we stayed there is that we could easily dump the car at a hotel and take the train into the tourist vortex charming city of canals. 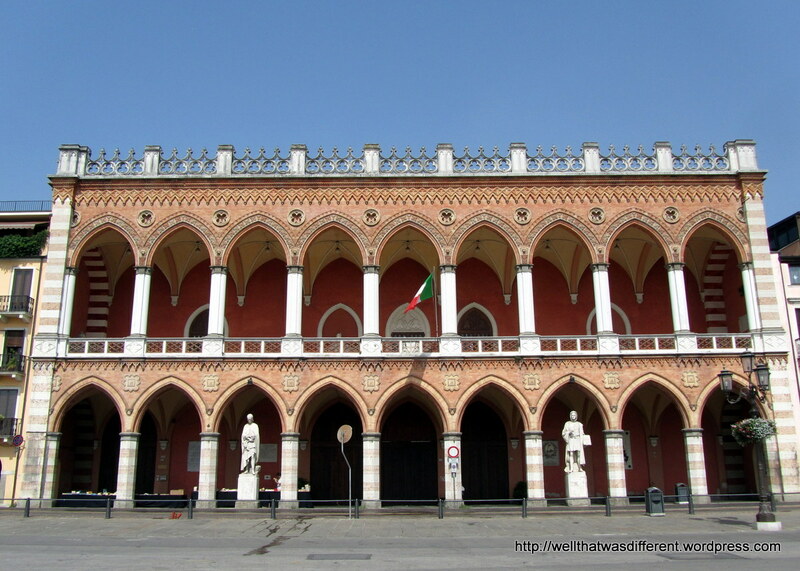 But Padua (Padova) turned out to be surprisingly interesting, so we spent a day and a half exploring it as well. 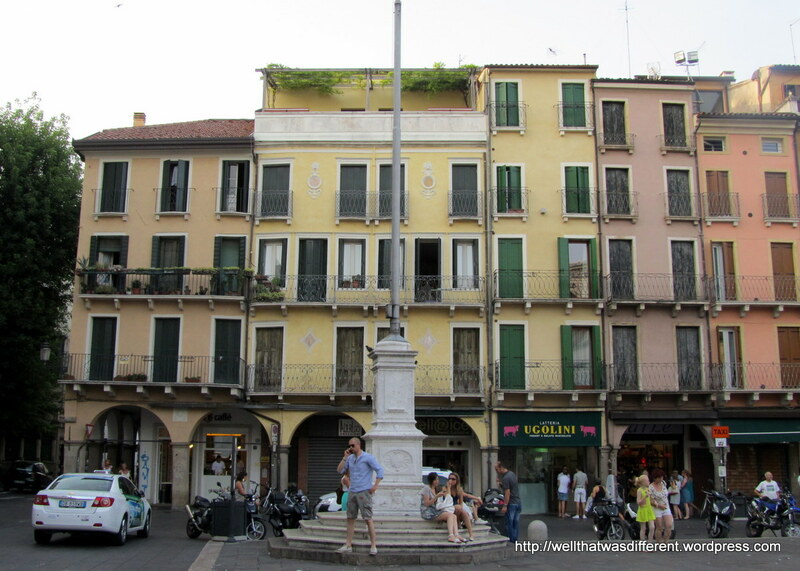 Padua is a college town, and consequently rather well-heeled, with plenty of cafés and restaurants. Also, a massive palazzo, the largest public square in Italy, and of course plenty of awesome food and wine! There were very few tourists: mostly Italians on holiday, and an international mob of pilgrims at the Basilica Sant’ Antonio. Otherwise, nothing was at all crowded. 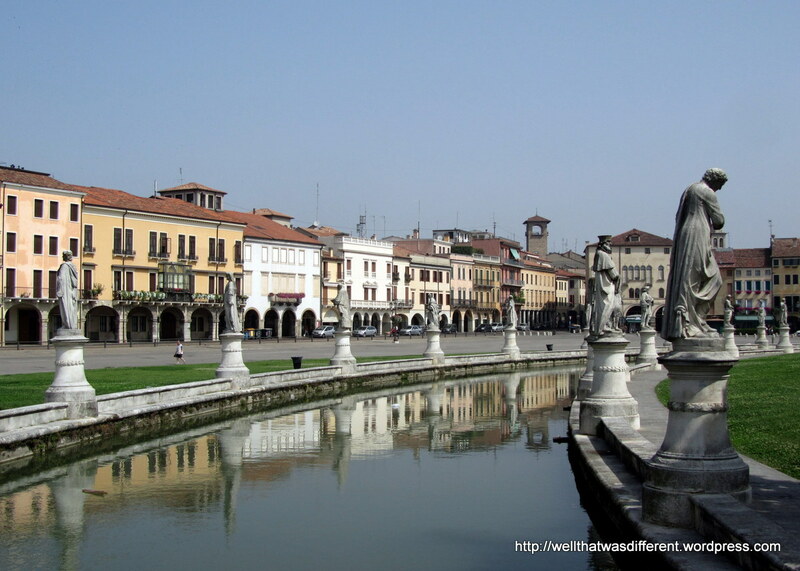 The one downside to Padua is that it has Italian heat without coastal breezes. It was just really, really hot and humid. I am southern, and can take the heat, but despite plenty of cold water and gelato, I was feeling some true heat exhaustion by the end of the day. We all stripped as soon as we got into the hotel room and raced each other for the shower! Thankfully, we had real air conditioning (a minor miracle in Europe) and a most excellent pizza place down the street had fresh, cold local wine on tap. The main piazza in Padova about gelato time on a hot day. 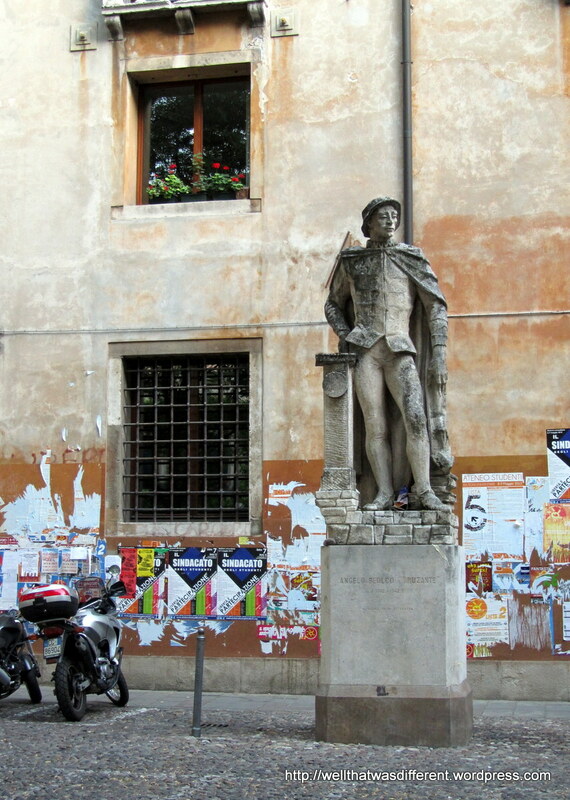 Italy in one photo: statue, stucco, scooter, and graffiti. 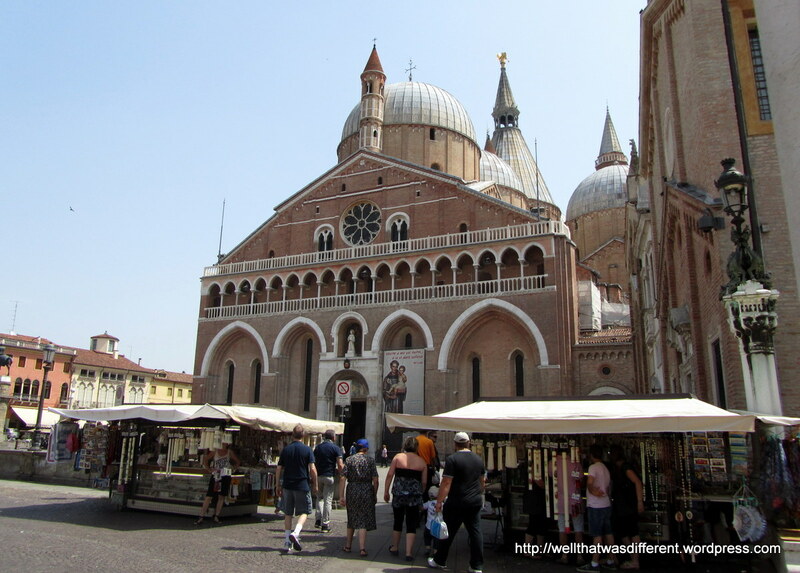 The major church in Padova is Sant’ Antonio da Padova. It is a major pilgrimage site, and jammed with people from all over the world. Unfortunately, photos not allowed inside. 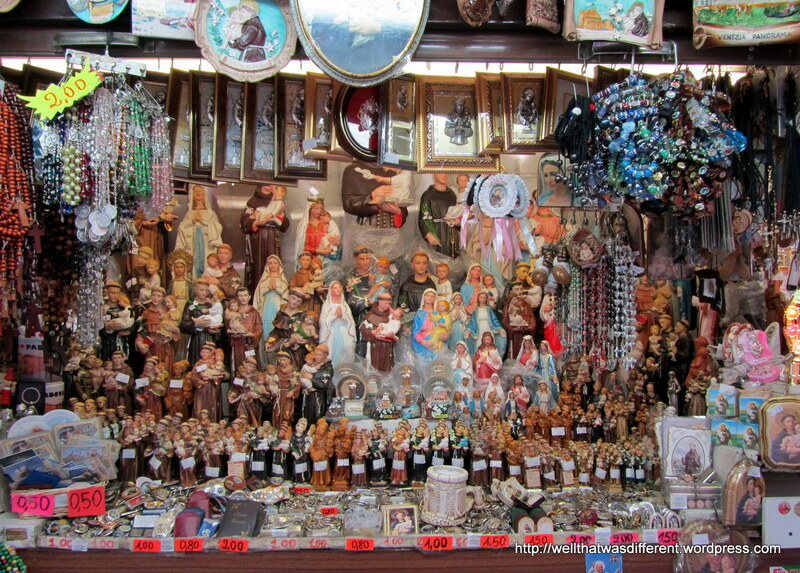 There was an impressive array of Catholic knick-knacks on offer around the church. Ever see the movie “Born in East L.A.?” Remember the Jesus with the 3D eyes that talked to Cheech Marin’s idiot brother? 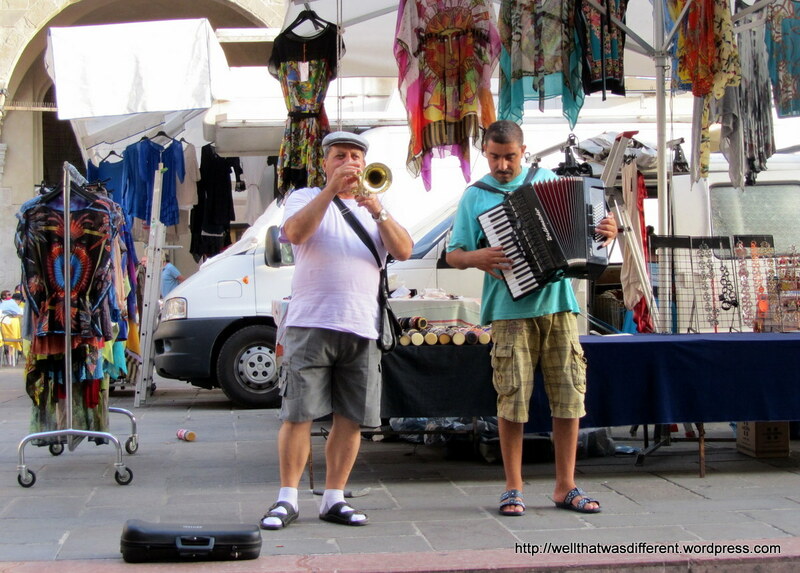 Yep, you can buy one of those in Padova. 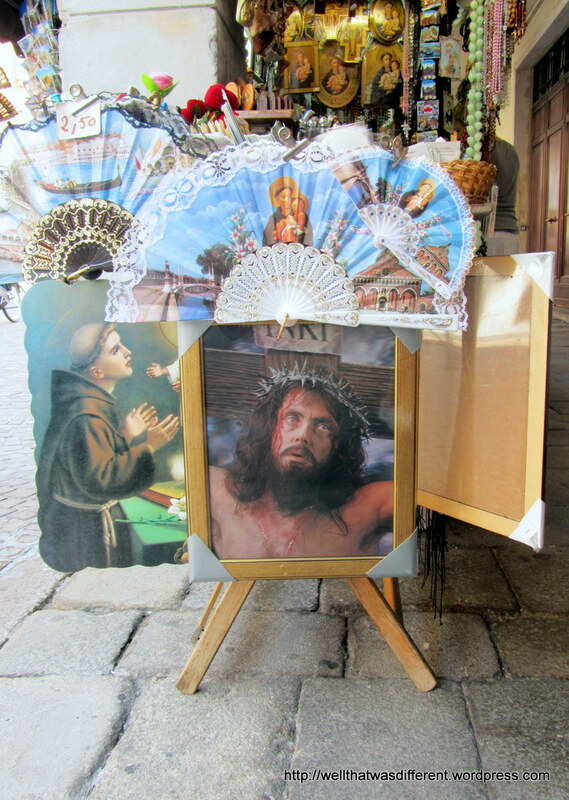 We went for the frilly St Anthony fans instead–which were truly a gift from God at 4 Euros a pop. 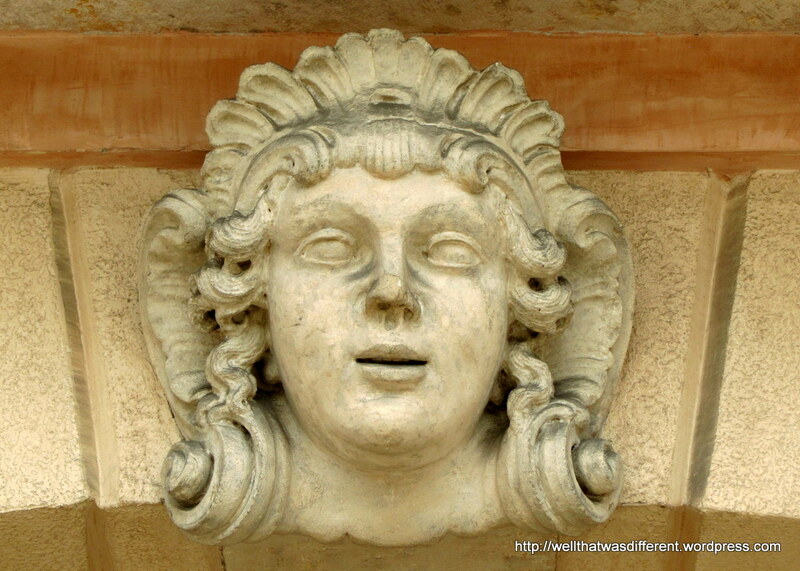 On the huge Prato della Valle, built over a former Roman coliseum. 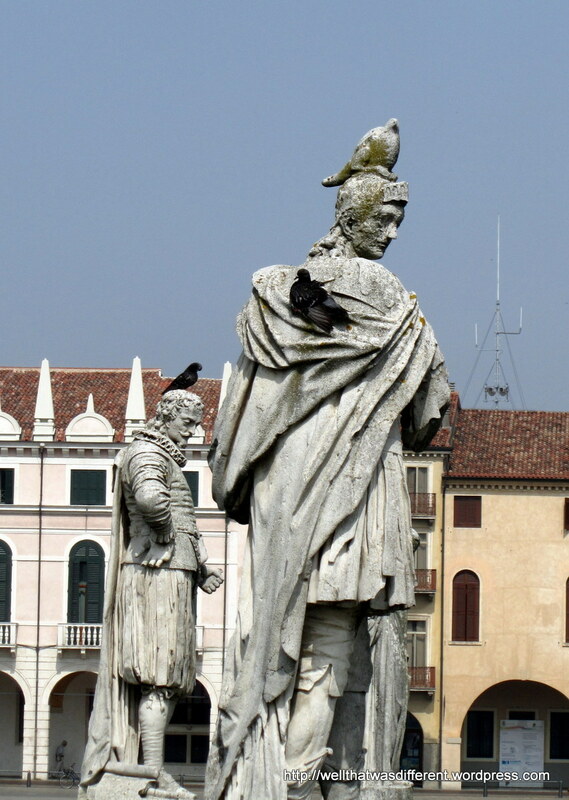 The sculptor knew pigeons would be sitting on his statues, so he went ahead and added a few! 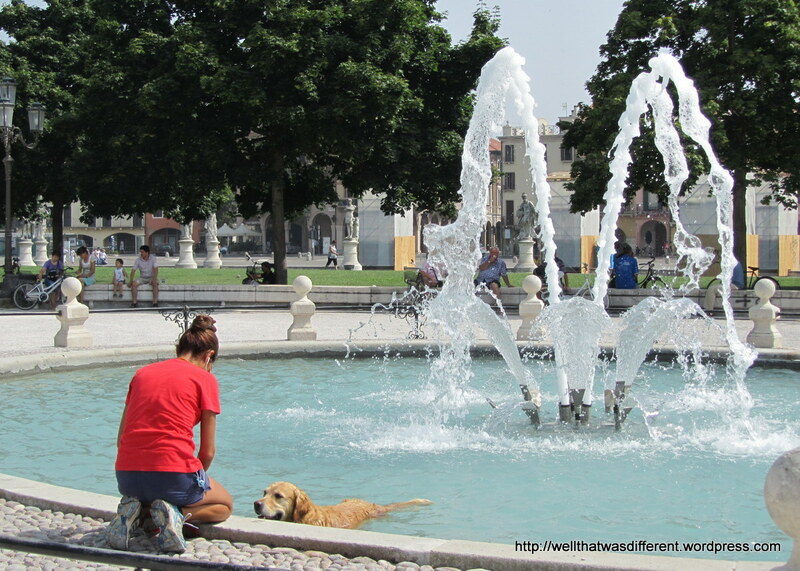 It was HOT and there was at least one dog in every fountain. Oh, to be a dog. Prato della Valle: the circular outline of the old Roman coliseum is clear. 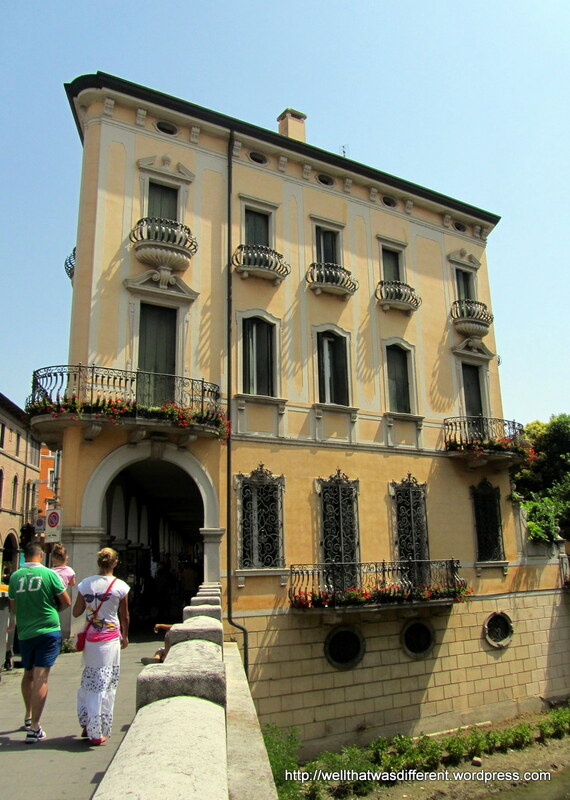 Nice palace on the Prato. The Basilica of San Giustina behind the Prato. 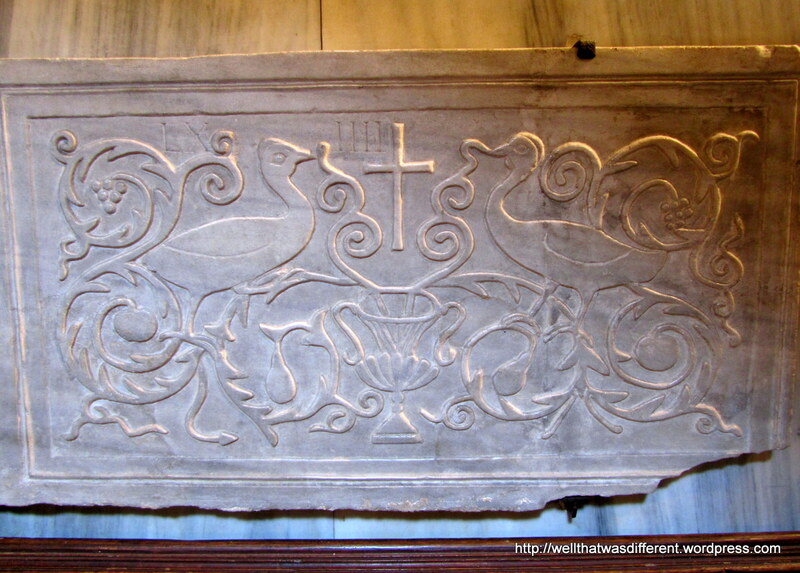 Quite honestly, I don’t remember which church these frescoes were in, but I liked them a lot. 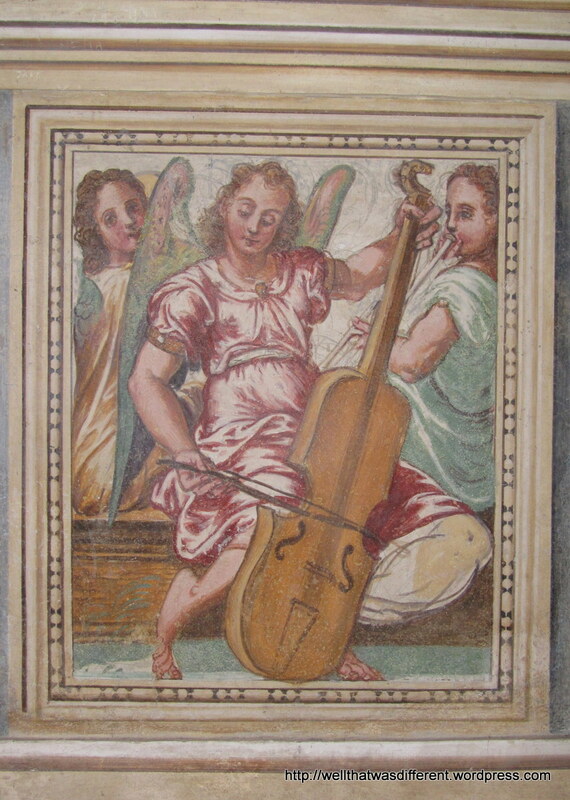 From the same church as the frescoes. Just a cool building on a bridge. Best part of my tour in Sarajevo was the proximity to Italy (only 8 hours!) I spent my 30th birthday in Venice in the snow then made two more trips there just because it is so beautiful.